With class leading performance specifications, feature rich advanced analysis features, next generation UI, and up to a 50% price advantage the MSO5000 brings uncompromised flexibility & capability to every engineer’s bench. We encourage you to compare the 5000 Series with the competitive Tektronix and Keysight and R&S solutions. See the benefits of 8GSa/sec sampling and long record length in comparison to the MSO2000B. Avoid undersampling and signal distortion. With up to 200 times the memory of the MSO2000B, the RIGOL 5000 gives you the best zoom, search, and measurement capabilities in its class. 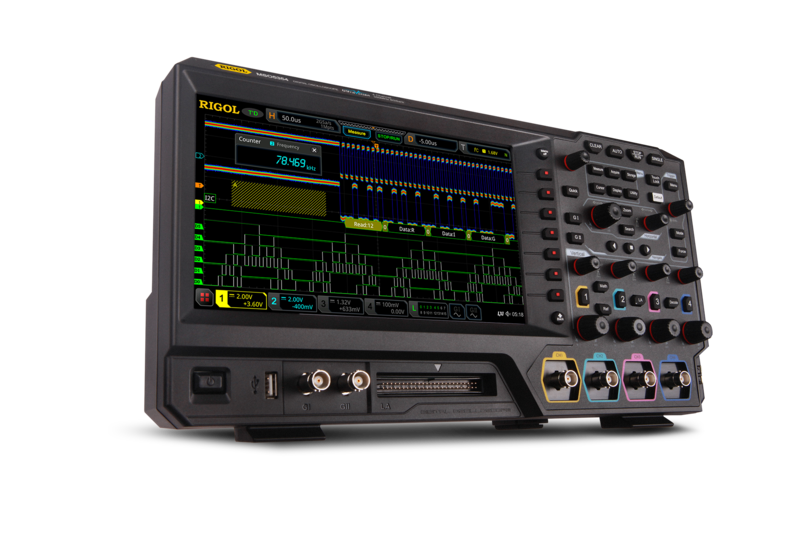 The RIGOL 5000 Series delivers high resolution FFTs (up to 1 Mpts) with Spectrum Analyzer like controls including span, peak search, and color density. Compare waveform capture rate performance of the MSO5000 and the MSO2000B. Significant performance advantages are delivered by the UltraVision II architecture. Moving Data off of the instrument for off-line analysis quickly and easily is important. See how the RIGOL compares to the Tektronix. Longer record lengths can make accessing data over USB a time consuming problem. See how the performance hardware architecture of the MSO5000 provides 11X faster access of a 10M record than the RTB2000. Fast Waveform Capture Rate minimizes deadtime to insure short duration signal artifacts are captured and displayed. With up 500,000 wfms/sec see how RIGOL provides ~10X the performance of the RTB2000.